What was it like to be at the Apple in April event at the Living Computer Museum on Wednesday, April 12th? I’m sure the experience was different for each of us but I can tell you how it was for me. First came getting there at all. I didn’t know about the meeting until a few days before (Monday, April 10) when HCLE consultant, Tom Trimbath, sent me a copy of a message he had received from Living Computer Museum + Labs marketing coordinator, Lauren Bayer. Tom keeps up on social media while I am sort of a recluse so I really appreciated his heads up. “Continuing the momentum, we’re excited to share that LCM+L will be hosting a new, permanent exhibit dedicated to the to the first two decades of Apple! 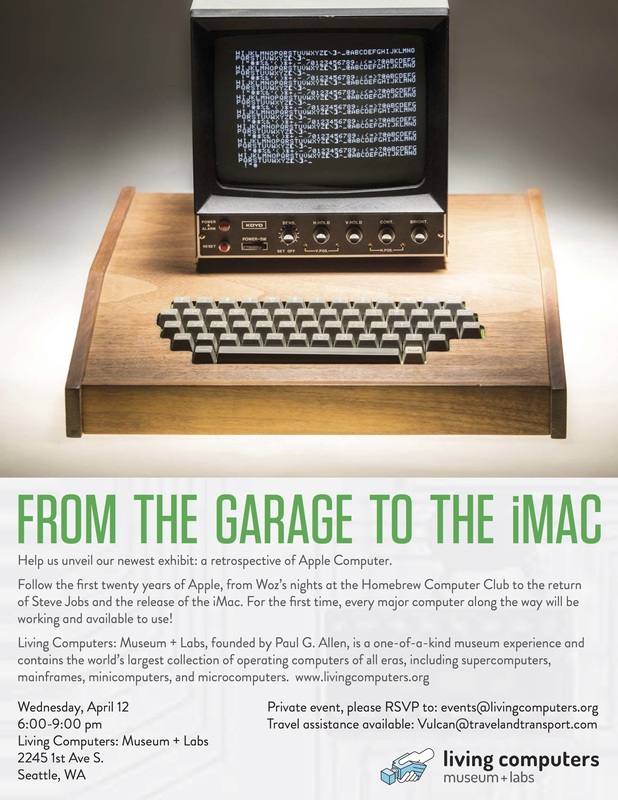 This will include three original Apple I computers, Apple’s first-ever product, including the only operable Apple I in existence available for use by the public and a unique demonstration model that was housed in Steve Jobs’ office until he first left Apple in 1985. The Apple Exhibit will open to the public on Friday, April 14. We appreciate your support in helping us spread the word within our community. In addition to a few images available for sharing on social channels or in a newsletter, we also crafted sample posts to leverage for your social media channels. Hmmm…LO*OP Center owns the first-ever Apple 1 off the assembly line and I had visited Living Computers two years ago. Somebody there knew about our machine but staff had changed. I wondered if they were interested in our Apple I so I telephoned Lauren. She was exceedingly cordial and promised to ask around the organization. I later heard that my call had caused quite a stir. Within hours an email arrived from Executive Director, Lath Carlson, with an invitation to Wednesday’s invitation-only party. I was thrilled. I didn’t pay any attention to who was going to be there but I wanted in. Luckily I didn’t have any pressing appointments to keep me from hopping on a plane to Seattle and my dog sitter was available! By Tuesday afternoon I was ready to go and I began worrying about what to wear – evening attire? Cocktails? Business casual? Jeans? Then I realized this was Homebrew. I’ve known some of these people since I was in my 20’s and I’m now over 70. It doesn’t matter what I wear. I decided to relax and have fun. Meeting Old Favorites. There were only a few minutes between checking into the hotel and catching our ride to the Museum. Standing in the lobby were magazine editors David Ahl of Recreational Computing and Tom Hogan of Infoworld, neither of whom I had met in the early days of reading what they wrote, but it’s not hard to identify aging geeks swapping stories. Four more new faces were in the limousine that picked us up. Museum staff welcomed us on the first floor. I glanced over the badges still waiting on the front desk. Oh, nice crowd! Haven’t seen him/her in quite a while. It was hard to tear myself away from the exhibits that have been installed since my previous visit and head upstairs to the party proper. Mike Willegal of the Apple I Registry sought me out, introduced himself and asked for a photo of the jumpers on our Apple I. There was Jim Warren from the West Coast Computer Faire, People’s Computer Company and many of my other old haunts. I hadn’t seen Gordon French from Homebrew since the reunion at the Computer History Museum in 2013. 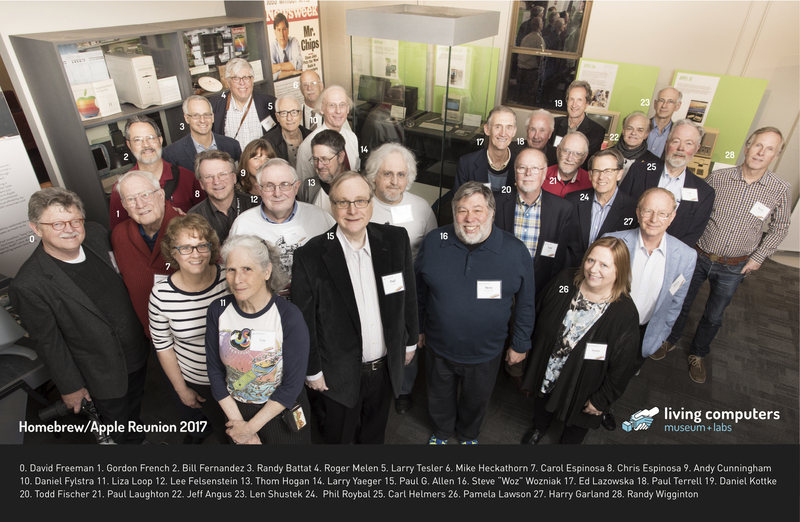 I’ve been working with Lee Felsenstein (designer of the Osbourne 1) recently so we were already up to date on our goings on but it has been perhaps 10 years since I’ve had a chance to chat with Len Shustak, co-founder and Chairman of the Board of the Computer History Museum in Mt. View, California. I’m actually not a very technical person and I remember struggling to hook up Apples, Pets and Radio Shacks to the Nestar network that Len and Harry Saal put together in the early 1980s. 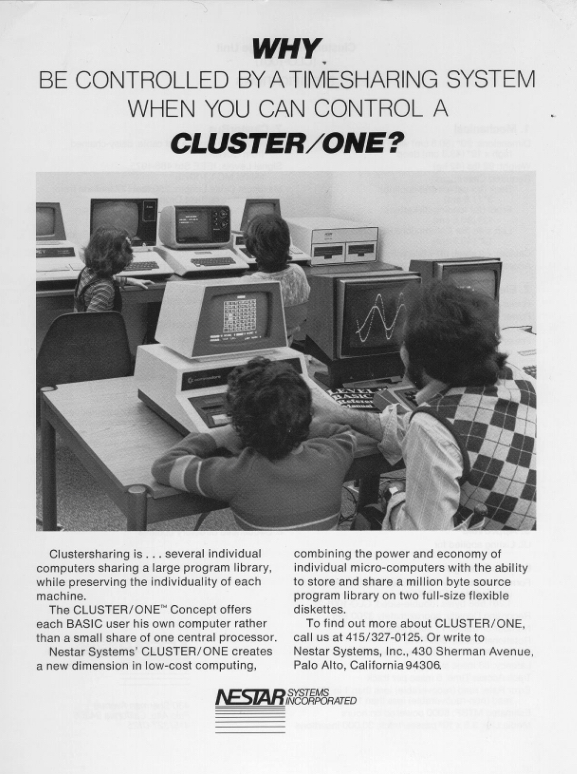 In those days, school kids who wanted to swap computer games really had to learn a lot about operating systems and hardware at a level way beyond scripting with a drag-and-drop interface. Many of the conversations I listened in on at this party were recaps of the hardware and software repartee around personal computers that has now been going on for more than 50 years. Hobnobbing with the Living Computer Museum Staff. While visiting with the computer aficianados of now and then was pleasant I found I had more to talk about with the young and enthusiastic educators and curators who comprise the staff of this unique museum. I slipped out of the party to chat with Nina Arens, education coordinator, about how to engage kids in coding activities and with Cynde Moya, collections manager and several others. I went back the next day for more and hope this is just one episode in a long, fruitful collaboration. Reflecting on the Experience. I won’t bore you with more name dropping but there were lots of other old acquaintances to say hello to. I was honored to be in the company of these pioneers of the computer industry but I was also aware that my own trajectory has always been a tangent to theirs. My passion is how people learn and how we can facilitate that learning more effectively, not bits, bytes, electrons and gates. I’m fascinated by how people think, especially people who think differently from the way I do. I love watching them solve problems but I don’t have much to say to them. It was fun to observe the renewal of long-term friendships and to hear the exchange of stories, of appreciation and of genuine concern. At the same time I realized that I did not form firm connections with those who were so instrumental to my career. I felt welcomed but still an outsider. Maybe it’s that reclusive aspect of my personality or maybe I’m just so oppositional that I’m always heading upstream when everyone else is floating down with the current. That’s what I was thinking about when I looked up and saw that the group picture was being taken from the side of the crowd where I was standing. I had thought I was in the back and instead I ended up in the front, near Paul Allen, co-founder of MicroSoft and the man behind this wonderful museum — whom I had not even met. Thank you, Paul, for hosting such an interesting party. Next time I’ll make a point of saying hello.